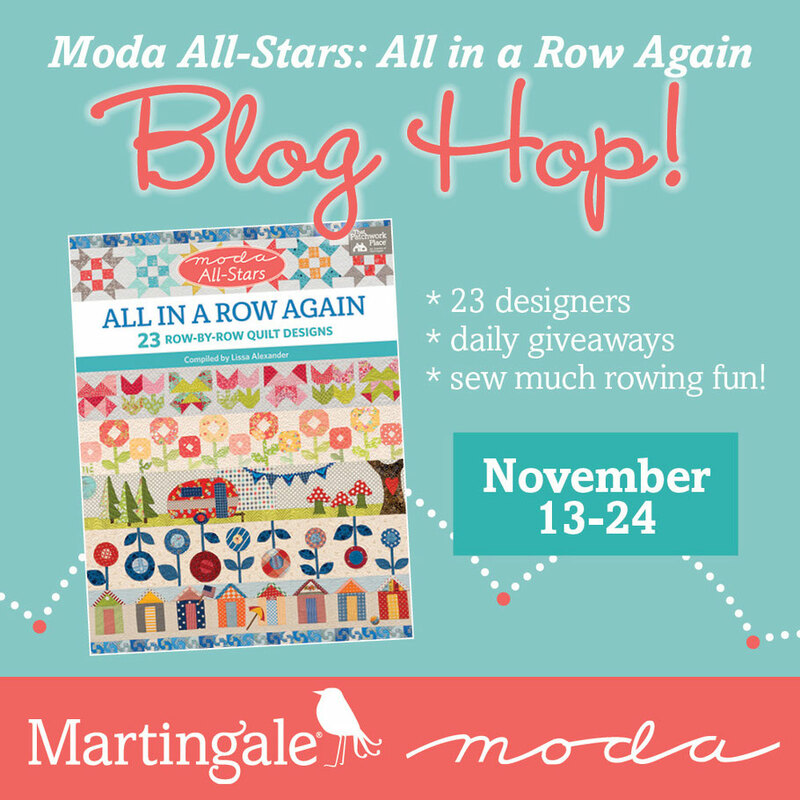 I am so excited to be a part of The Moda All Star, All In a Row Again book. I had so much fun designing this row and hope you enjoy combining it with other rows to make your own creation. I love all the rows and they match every designers personality. I do have a few favorite rows in the book though. My first favorite is Kate Spain’s Barn Cute. I just love the whole concept of the barn quilt and think it is just the neatest thing to do. My dad is a farmer in California and my mom and I think his barn would be perfect for a barn quilt. Another favorite is Autumn Wind by Kathy Schmitz. I just love the block design and those embroidered birds with the acorns are absolutely perfect. I have just started to play around with embroidery and can only dream of being as good as Kathy. Sandy Klop is someone who make everyone smile and she manages to do it with the Beach Houses row. I love how she created the water and the little beach house are just so cute. I love the beach and this row just makes me want to take a drive over the hill and walk on the sand. Also visit Laurie Simpson as she shares her row today. Although I super excited about being a part of this book and sharing my designs, the part I am most excited about is that this book supports such a wonderful cause. Give Kids the World Village helps children with life-threatening illnesses enjoy weeklong, cost-free vacations with their families. Together, the designers are donating royalties from the book’s sales to benefit this charity. It's such an honor to be a part of this! I'd like to see rows with similar elements depicting the changes. Maybe trees or houses or barns separated by traditional squares. Pardon me if that's already bee done. My favorite row quilt (or any style of quilt) seems to be whatever I'm looking at at the moment - such beauties being created all the time! I need 300 years to make just some of the coolest ones! I love your darling flowers and butterflies! I love seasonal quilts. I love decorating and look forward to every season and changing out my quilts. My favorite would be seasonal row quilts. Your row would be great for a Spring or Summer quilt. Thanks for the chance to win an ecopy of this great book. Lovely row. One could make several of them in different colourways for a really fresh quilt. I love seasonal Whimsical quilts, the more colorful the more I enjoy them! quiltlovefordomesticfelicity(at)gmail(dot)com Have a blessed day! I like rows all kinds of rows! But lately it has been rows that are scene's with houses, trees and things. My favorite row quilt is fall themed. I love the oranges and yellows against the darks like purple and black. For some reason I always seem to gravitate to the fall themed quilts. This is nice to get sew many ideas for quilts, tabletoppers and wallhangings. I love to have seasonal quilts. The row by row blocks are great for table runners too. So many possibilities with these patterns. I love sesonal quilts and row quilts are just so much fun! to make 4 distinctly different quilts! I love seasonal row patterns, so they can stand on their own or be combined to represent the year. I like making row by row theme quilts with traditional blocks within the row. I think it brings an unexpected eye catcher. Maybe my favorite is Spring or Christmas. Yours is cute. I love buildings, whether they be Beach Houses, Homes or Barns, even little bird houses, all surrounded be lots of beautiful flowers and trees. I think about the National Parks a lot. Nearly everyday. I would like to see a National Parks Row by Row"Find Your Park" theme. There are so many creative ideas on this one running around in my head but quilt designers could do that better than I. Thanks! I like to make seasonal rows. I like a row quilt that has a lot of different types of blocks and uses lots of different fabrics. I think all that variety makes it interesting to look at. I have done a few row quilts. I don't lean toward any one style. Thanks for the chance to win. My favorite would be a seasonal Row by Row with each Row suggesting not only the seasonal weather, but perhaps with holiday theme as well! I like row quilts that represent seasons. Like one that represents fall with pumpkins, leaves, blackbirds, scarecrows. I am happy with any type of row quilt. They are fun! Might be interesting to see some rows focusing on different nationalities. I would like to make a spring/summer quilt as that is my favorite time of the year! I like seasonal rows. I have seen some amazing row quilts. schroeppelr at yahoo dot com. I haven't made a row quilt but I love some of these rows the beach huts, camper and flowers all remind me of summer. I love seasonal quilts. My 10-year old granddaughter is having fun using your pre-printed Little Red Riding Hood to make a quilt and doll for her new cousin that is due in December. Your row is so cute! Thanks for hosting this giveaway, and supporting Give Kids The World. I love rows....all of them. No faves for me. :) I would love to win an ebook copy of All In A Row Again! These rows are so cute and clever. Needs to be my next quilt project. Farm houses and barns are my favorite row subjects. I like row by rows that I can use year round: bed quilts and wall hangings. I love the seasonal row by row! Can't wait for the Autumn book to come out. Those are my colors! My favorite rows would be the flower rows....yours is beautiful! I like anything with flowers. A row quilt with different designs of flowers would be great! kocanquilt@gmail.com. I like the seasonal rows the best, especially those from my favorite season Spring! Love the new row book . Thanks for the chance to win! Seeing the differences in each of the rows is great! I love the patchwork rows, but the appliqué adds a whole new fun look. Love the campers in a row. So excited to play with these designs. You all rock! I like rows that depict state animals and flowers. I don't have a favorite for row quilts, as long as there is some kind of theme or color scheme, I'm happy! I haven't yet tried a row quilt, but I would love to try one. This looks like a good one to start with. I love the spring/summer ones as I love those types of fabrics!! But I'm interested in doing the buildings and houses! The possibilities are endless. This would make a great small group project with no two quilts alike. I like all of the row quilts I have seen. I like the row by row put out by quilt shoppes , the seasonal rows and the holiday rows and then don't forget the classic blocks. Hard to decide. Thanks! Our farm is called Four Seasons Farm so seasonal decor fits right in at our house. 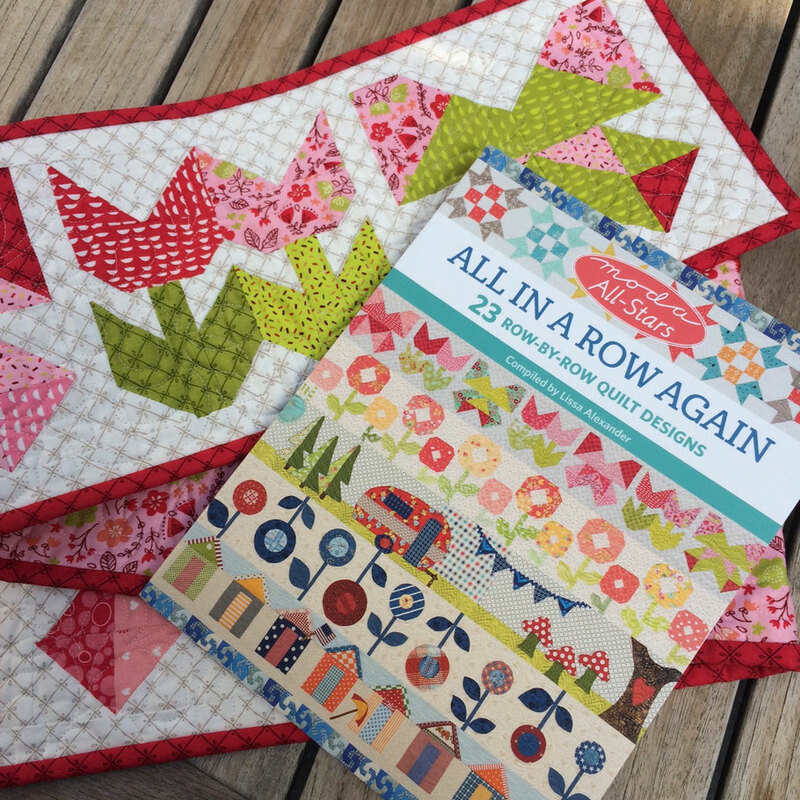 I love seasonal quilts so this book is perfect! I love whimsical holiday rows. My favorite would be a Halloween row with cats, pumpkins, witches, and ghosts. I love seasonal quilts particularly Halloween and Christmas. Love seasonal quilts! They seem special since they are only out for a short time. I like to do rows out of material I love, weather it’s seasonal, children’s or whatever. So much to choose from.. I am on my 3rd baby quilt in the last couple of months. I have a very important one to make yet, for my first grandson! So I am saying nursery! I absolutely love row quilts. You can have so much fun with them. Can't wait to win my copy! I really like camping, so anything that fits with camping in a row, or rows would be my choice. I lov3 sewing different shapes of campers, tents, campfires, trees, and anything else that you would find camping in nature. Such a cute row, thanks for the chance to win. Love the tulips and butterflies, so very colorful and spring like! Would love a seasonal row by row. Then I can break it down into runnners as well! Wonderful book and sweet tulip-butterfly row. Thanks! Very pretty row. I love tulips!! Such pretty posies as my grandmother would have said! Beautiful alone or as a larger quilt! I love rows that show a scene or tell a story. Although I equally love any row with star blocks! I love the seasonal rows.....with a nursery theme being a close second. My favorite rows make me feel a connection to a specific place or region. Thanks for the giveaway! I'm going to go with seasonal although it is a hard decision. Thanks for the opportunity to win. I like the landscape rows the best, although the animal/creatures are a close second. Your row is sweet. Thanks for sharing the giveaway too! I usually like row quilts with host pieced and applauded rows......any theme is good. Love the idea of mixing and matching rows and designers! Allows all of us not- so-creative types to be creative within the parameters of our abilities! Thanks for the opportunity to win a copy. The tulips are do cheerful. Great for winters full day. Would like this book of rows. Love the assortment of rows...something for everyone. I would like a row quilt that showed the seasons or events that happen throughout the year - New Years Day, St. Patricks Day, Easter, July 1st, First day of school, etc. I love spring themed rows showing houses and trees and flowers in bloom!! I’ve not made a row quilt yet. I think I too would made a season one for hanging. I currently am working on a fall applique quilt. I have been making a lot of baby quilts lately for new great-nieces and nephews. So I would put baby themed rows together! I've never done a row quilt.....this looks awesome. I'd probably do the house, flower , camper one.....love it. I tend to favor seasonal themes, but, really, holidays are seasonal, too. Right? I have never made a row quilt but am so inspired and would love to! I have the perfect April Rosenthal fabric for it! My favorite would probably be seasonal. There are so many cute rows in this book. It would be a great addition to my quilting library! I think my favorite row quilt would be a summer themed one. The book looks like a lot of fun! I believe I would have to say I like seasonal--but I like all the rows in this book--so great! Your row is so pretty and cheerful. I have the first book and know that I will be needing this one too. This book looks amazing.. can see making a row quilt or just using some of the rows as a wall hanging, table or bed runner. dquilterguy48329 (at) prodigy (dot) net . enjoying the blog hop... first time following this one or even paying much attention to Row by Row quilts. I haven't made a row quilt yet. I think I'd better get started on one. Love your row! This book is filled with great ideas! Love them all! Have not tried a row quilt yet. The book would be fun for inspiration to get busy on one. I tend to like the house/buildings the best. Seasonal, that way I can keep the decor fresh. Fabric is always adorned somehow in my home, whether in a hanging quilt, a table topper, oven mitt, tied on gift. I appreciate the opportunity to row along w/you and all your inspiration . The opportunity to give a child and their family the world is very special and it's cool to know so many are involved in making this come to fruition for them. i love all the rows, but would pick spring/summer as my favourite season, using many of the rows to make a quilt for the travel trailer. Looks like a wonderful book! My favourite would be houses and trees. Thank you for the chance to win. My favorite row quilt would be seasonal. A theme row quilt would also be nice. thank you for your butterflies & flowers.